Biased is right. Our California oranges are absolutely the best. And, we do not dye our fruit! I'm standing in the Publix fruit department full of dyed Sunkist oranges. Frustrating not finding a decent Florida grown orange to save my life..
One thing nobody's mentioned - orange flavor. Whenever I cut open a FL orange, I get an immediate orange aroma that almost fills the air. When I cut open a CA orange, hardly any. They're both sweet, the FL one being much more juicy. The CA orange just doesn't taste much like an orange, it's almost all fructose. I'll take a FL orange with its full, orange flavor anytime over a CA one. And I'm in NY, never lived in FL nor CA. Florida fruit are the best. I am from Florida, but I now live in Utah and can only get California citrus. 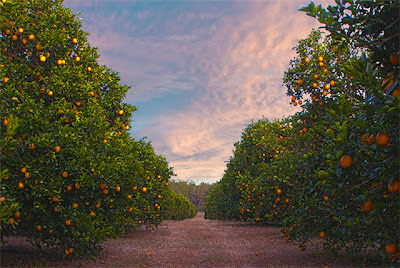 California's really are prettier and not bad, but, I'll take a Florida orange any day over California's. Florida's are just so much juicier and sweeter. Taste and juiciness are what I prefer over looks. I am from Virginia and absolutely love oranges. I have bought both California and Florida oranges and I must say that Florida oranges are the best hands down!! California oranges have thick peels small fruit inside, dry and not very sweet. Florida oranges are juicy and super sweet. When shopping for oranges if they say California I leave them on the shelf. 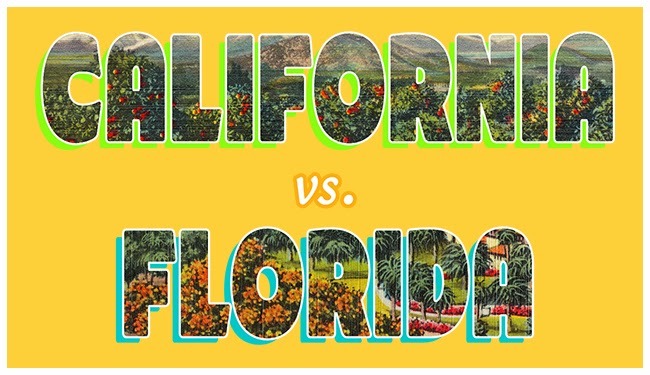 I've lived in both California and Florida, it's a bit more complicated than that. For one thing, whether an orange is labelled as Californian or Floridian has a lot to do with the loading docks used, often more so than the state it was produced in. I've known truckers that would run citrus to specific states to unload and then reload it so it could be labelled as being from that state. As such, if you're not getting it from the farmer's field, you usually have no idea where that orange is from. 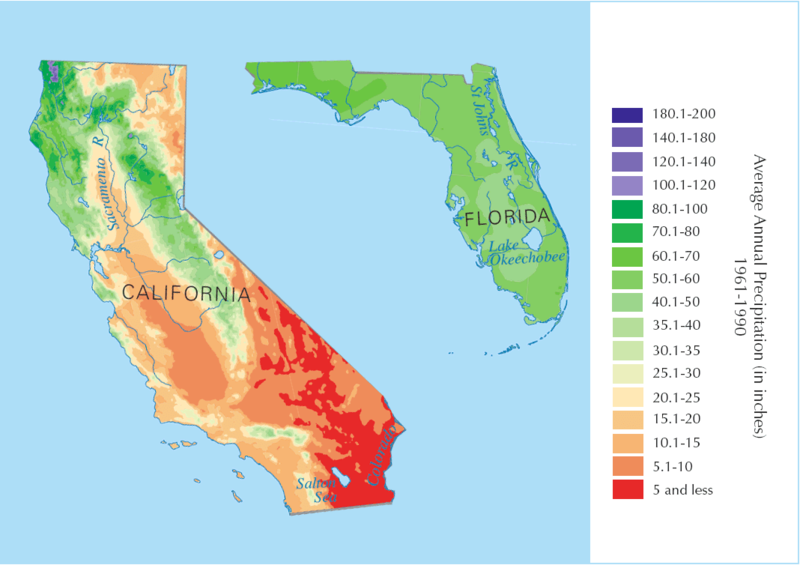 A note on rainfall: if you look at the map of CA above, that green bit in southern California where the rainfall is similar to FL is near where a lot of the oranges are grown, and regardless, they're all still fed water from the LA Aqueduct. Additionally, California oranges are grown west of the pacific coast mountains where it is significantly more humid than most of SoCal. What I'm getting at here is that the climate isn't actually that different. Final point: I have tasted oranges from market stalls on farmer's properties in both states. Both are far better than you'll ever get in a grocery store. Farmers usually sell their worst crops to retailers and specific cultivars that are easier to peel, etc. and the very worst are exported to other states where people aren't close enough to the fresh product to tell the difference. Good, fresh CA oranges are usually a little bit harder to peel, a little more juicy, and a little more flavorful than a good, fresh FL orange. The same factors that create cultivars of Navel and Valencia oranges which are easier to peel makes them less juicy and makes the pith more bitter. I prefer CA oranges by a small margin, but what I'm getting out here in Utah are all crap no matter where they say they're from. The best oranges are the nave late in Valencia, Spain. The best California oranges go to japan,I guess they pay top dollar for them. If you go to porterville ca. Ask for 88s off the belt from a packing house. California had a very bad drought 2015-16 so a lot farmers let their trees dry up between porterville and Bakersfield, and put in pistachios. I just told a group of people that california's navel oranges are the best. And I absolutely do not care for florida's oranges. I like perfect!!!!! I live in a small town near Redlands, Ca. I have had many opportunities to get the oranges right from the groves there. There is no comparison when it comes to buying in store and getting them right off the tree. 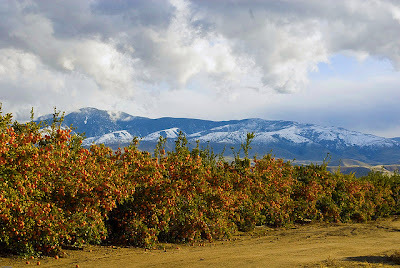 I do know that this area is prime for growing citrus as at one time Redlands was the largest producer of oranges in the entire world! The best oranges I have ever eaten were bought and consumed in Florida. I've had oranges shipped to Missouri from both California and Florida, and even though both types used to be tasty, as the years have gone by, their quality has hit the skids. Climate change? Perhaps. What it boils down to, to me, is that I might as well get oranges at Wally World. It makes me sad. We live in Oregon now but years ago we lived in So. Calif. and had a big beautiful Washington Navel Orange tree in our back yard. I have never had a better Orange since. Lived in Georgia for a time also. The Florida oranges seemed almost albino to me as compared to California. Maybe we were getting a lousey sampling, I don't know for sure. I do know the California oranges we got back in the 60s were far better than the ones we get now? They're supplying me truly valuable suggest that rapidly designed a variation. We are at this time doing pay per visit recruiting. professionalseoservicescambridge uses sophisticated info evaluation to create their method. They all are regarding information and also enhance my personal Return on investment every month. copd Some of the costs covered by this insurance include funeral service, cemetery plot and headstone, casket, funeral procession and other miscellaneous costs.